Ergonomic and soft booster cushion. Backrest adjustable to several positions. Suitable from birth up to 6 months (max. 9kgs). 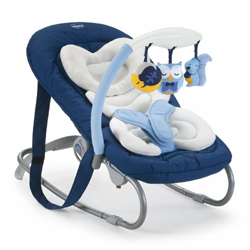 With its 2 position (fixed and rocking), its soft cushion for new-born, this bouncer will help getting your little one (and yourself!) comfortable while staying in France. Its 3 rattles will entertain baby. Very usefull to have baby installed "like at home".